We have reached critical mass! Square Enix knows it is hot right now, and its merchandising squad is having an absolute field day. I don't think the world can handle this much Final Fantasy! Don't worry everyone, I am willing to take the brunt of this assault. It's what I was born to to! Joining the ranks of Fallout and The Legend of Zelda, Final Fantasy VII is the latest video game that will be given the Boardwalk treatment. 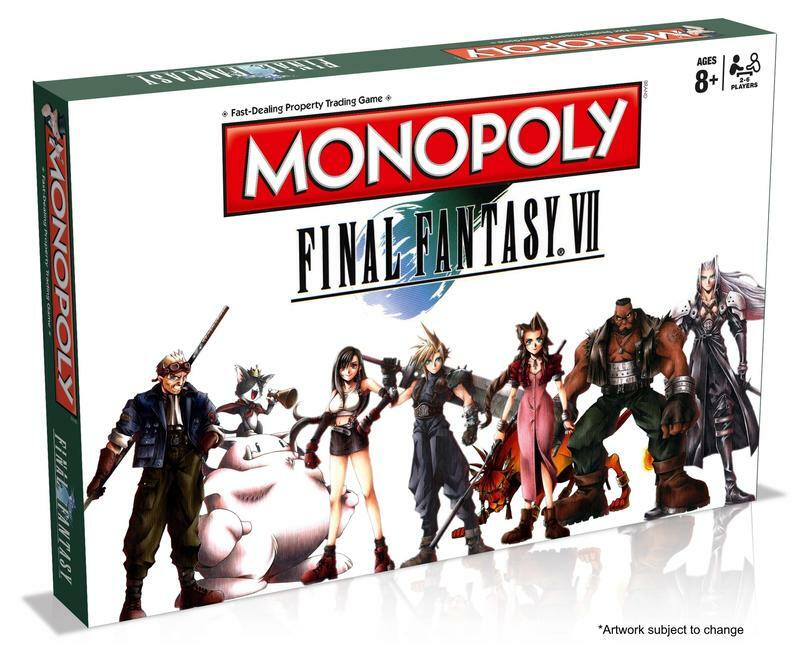 Square Enix and Monopoly, cracking heads together to hopefully shake a few more dollars from the fanbase's pockets. This iteration of the game will be on sale from April 11, 2017, and it will cost gamers $49.99. Just a personal side note, how great is that original Final Fantasy VII character art? We've been so far removed from the original game and smothered with spin-offs and fan art over the last 20 years that it is easy to forget, at one point, Final Fantasy VII was just a single video game. If only I could go back and live it all from the beginning, back to where it all started with just a spiky head of hair and a giant sword. Back before the need for Monopoly iterations. It's every family's favourite board game in a Final Fantasy 7 theme, so it will feature Cloud, Aeris, Sephiroth and all your favourite characters and locations. Whether your plans are to buy housing for the people or build a Mako reactor plant, you'll soon discover the real nature of Sephiroth's evil is the extortionate amount of rent he charges. Uh, yeah. Fellas, I don't see Yuffie on the front of that box. When you say "all your favorites," I know that includes the secret characters, right? Because as it stands, my favorite is nowhere to be seen. Online retailer Merchoid will be the first place that sells it.